If you have not yet heard of Aimovig, it’s a new preventative migraine treatment option for adults. After having many conversations about the medication with my neurologist, I’ve learned that it is a CGRP (Calcitonin gene-related peptide) inhibitor. From what I understand, the release of CGRP in the brain causes inflammation and this medication inhibits that inflammation and therefore may inhibit migraine. During my monthly nerve block / check in appointments, my neurologist and I regularly discuss a list of medications to try in the future. Therefore, the decision to try Aimovig did not sprout out of one conversation with my doctor. Instead, we had many conversations about the medication well before it was accessible to the marketplace. And when it finally became available, my doctor advised that I take it and I agreed with the game plan. In theory, getting access to medications should be easy: your doctor sends the script to a pharmacy and then you pick up the medication at the pharmacy. Easy, right? Not exactly. Aimovig needed to be ordered through a specialty pharmacy. On top of that, the medication was new to the market and in high demand for migraine sufferers like me. When my script was originally submitted by my doctor’s office and I still didn’t see progress or updates from Aimovig, I called their support team. Needless to say, I am glad that I called because I learned that they had lost my name in the system. In result, I was moved to the bottom of the list, adding an anticipated additional month of wait time for me to receive the medication. For days, I called to check on the status, the wait time involved between 30 minutes to an hour and a half to get through to an operator. At one-point I had my mom call in for me when I was too busy to check on the progress. Fortunately, after hours and hours of waiting, I spoke to someone with authority and she found my name and somehow got me back to the appropriate place in the queue.Whew. Once my medication was through the Aimovig pipeline and passed over to the associated pharmacy, the medication was overnighted to me. The day the package was set to arrive, I woke up excited and energized. And when I saw the box waiting at my desk at work, I couldn’t stop smiling. I then sat down and physically hugged the large box filled with medication, something that I did not realize I was doing until my colleague laughed at the scene. The medication sat within a cooler filled with icepacks. I removed the medication, read the instructions many times over and waited for more than 30 minutes for it to sit in room temperature before sneaking into a back room to give myself two injections. My package had two injection pens within it, each was a teal color with a purple button and Aimovig written on the side on a white label. After a month of waiting and hoping for relief, I started the same process to track down the second round of injections. This meant making calls and giving myself two more injections once the second package arrived. While the more tactical “work” felt annoying and frustrating, the actual injections felt simple and seamless. The good news is that the first two months of medication were free given Aimovig’s promotional offering – an amazing opportunity! I’m two months into my treatment and I have not seen any improvements. Yet, I am hopeful (something that I rarely feel). Why? Honestly, I am not totally sure. I may be hopeful because I’ve read that this medication has some stellar results for complicated migraine patients like me. It’s also reassuring to hear that other migraine patients that I engage with on social media are already finding relief. On top of that, I am feeling more ready than ever to break the migraine that I’ve now had for 5 years without a minutes break. 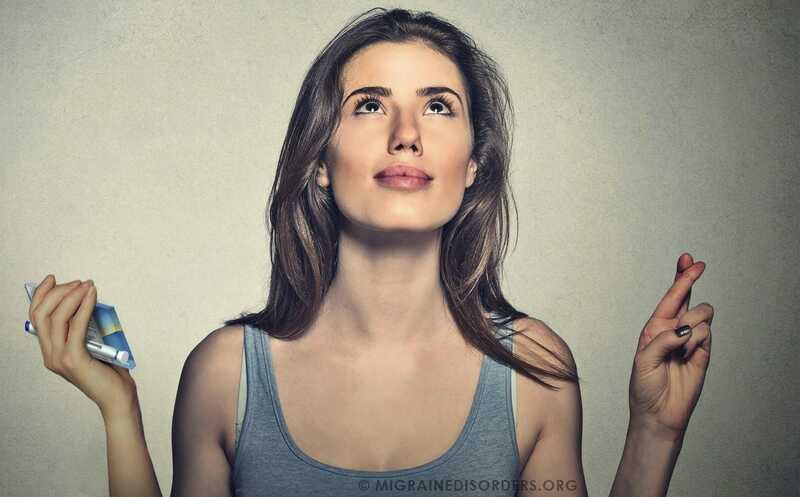 Regardless of whether this medication improves my migraines or not, I am happy to see that others are finding positive results for their migraine pain. My fingers are crossed for me and all the other migraine sufferers out there who are desperate for relief! 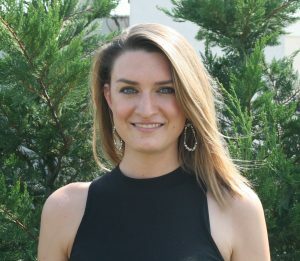 Danielle Newport Fancher is a writer and chronic migraine patient who lives in Manhattan. She’s sick of the stigma that a migraine is “just a headache” and she’s made it her mission to change that perception. Fancher attended Skidmore College, where she received her BS degree in Management and Business. She currently lives in Manhattan and, in her spare time, can be found writing at her favorite coffee shop in Gramercy. Follow her on Instagram, Twitter and Facebook @MigraineWriter and check out her website www.migrainewriter.com. SEE MORE OF DANIELLE’S BLOG POSTS HERE.